A process for the desulfurization of hydrocarbonaceous oil wherein the hydrocarbonaceous oil is contacted with a hydrodesulfurization catalyst in a hydrodesulfurization reaction zone (3) to reduce the sulfur level to a relatively low level then contacting the resulting hydrocarbonaceous stream from the hydrodesulfurization zone with an oxidizing agent (8) to convert the residual, low level of sulfur compounds into sulfur-oxidated compounds. The resulting hydrocarbonaceous oil stream containing the sulfur-oxidated compounds is separated after decomposing any residual oxidizing agent by contacting the stream with an adsorbent material (18, 30) to adsorb the sulfur-oxidated compounds to produce a hydrocarbonaceous oil stream having a reduced concentration of sulfur-oxidated compounds. The spent adsorbent (18, 30) is regenerated and subsequently returned to adsorbent service. There is an increasing demand to reduce the sulfur content of hydrocarbonaceous oil to produce products which have very low concentrations of sulfur and are thereby marketable in the ever more demanding marketplace. With the increased environmental emphasis on the requirement for more environmentally friendly transportation fuels, those skilled in the art have sought to find feasible and economical techniques to reduce the sulfur content of hydrocarbonaceous oil to low concentrations. Traditionally, hydrocarbons containing sulfur have been subjected to a catalytic hydrogenation zone to remove sulfur and produce hydrocarbons having lower concentrations of sulfur. Hydrogenation to remove sulfur is very successful for the removal of the sulfur from hydrocarbons that have sulfur components that are easily accessible to contact with the hydrogenation catalyst. However, the removal of sulfur components that are sterically hindered becomes exceedingly difficult and therefore the removal of sulfur components to a sulfur level below 100 ppm is very costly by known current hydrotreating techniques. It is also known that a hydrocarbonaceous oil containing sulfur may be subjected to oxygenation to convert the hydrocarbonaceous sulfur compounds to compounds containing sulfur and oxygen, such as sulfoxide or sulfone for example, which have different chemical and physical characteristics which make it possible to isolate or separate the sulfur bearing compounds from the balance of the original hydrocarbonaceous oil. The disadvantage to this approach is that the isolated sulfur bearing hydrocarbon compounds are still not useful as a sulfur-free material and therefore the yield of a sulfur-free material from the original hydrocarbonaceous oil is less than desirable and therefore uneconomic. US 2,769,760 discloses a hydrodesulfurization process which reduces the organic sulfur concentration in a hydrocarbon feedstock. The resulting hydrocarbon product from the first stage hydrodesulfurization zone contains sulfur and is subsequently introduced into a second stage partial desulfurization and/or chemical reaction wherein the second stage treatment is conducted at a temperature of approximately 232°C (450°F) and at atmospheric pressure in the absence of hydrogen. The contact material for the reaction in the second stage is of the same type as used for the hydrodesulfurization reaction. Preferred contact materials contain cobalt and molybdenum. Published European Patent Application No. 565324 discloses a method of recovering an organic sulfur compound from a liquid oil wherein the method comprises treating the liquid oil containing an organic sulfur compound with an oxygen agent and separating the oxidized organic sulfur compound by separation means such as distillation, solvent extraction and/or adsorption means. US 3,551,328 discloses a process for reducing the sulfur content of heavy hydrocarbon petroleum fractions by oxidizing the sulfur compounds present in such heavy hydrocarbon fractions and contacting the heavy hydrocarbon fractions containing such oxidized sulfur compounds with a lower paraffmic hydrocarbon solvent in a concentration sufficient to separate the oxidized sulfur compounds from the heavy hydrocarbon fractions and recovering a heavy hydrocarbon fraction of reduced sulfur content. US 6,277,271 Bl discloses a process for the desulfurization of hydrocarbonaceous oil wherein the hydrocarbonaceous oil and a recycle stream containing sulfur-oxidated compounds is contacted with a hydrodesulfurization catalyst in a hydrodesulfurization reaction zone to reduce the sulfur level to a relatively low level and then contacting the resulting hydrocarbonaceous stream from the hydrodesulfurization zone with an oxidizing agent to convert the residual, low level of sulfur compounds into sulfur-oxidated compounds. The residual oxidizing agent is decomposed and the resulting hydrocarbonaceous oil stream containing the sulfur-oxidated compounds is separated to produce a stream containing the sulfur-oxidated compounds and a hydrocarbonaceous oil stream having a reduced concentration of sulfur-oxidated compounds. At least a portion of the sulfur-oxidated compounds is recycled to the hydrodesulfurization reaction zone. US 6,171,478 Bl discloses a process for the desulfurization of hydrocarbonaceous oil wherein the hydrocarbonaceous oil is contacted with a hydrodesulfurization catalyst in a hydrodesulfurization reaction zone to reduce the sulfur level to a relatively low level and then contacting the resulting hydrocarbonaceous stream from the hydrodesulfurization zone with an oxidizing agent to convert the residual, low level of sulfur compounds into sulfur-oxidated compounds. The resulting hydrocarbonaceous oil stream containing the sulfur-oxidated compounds is separated by solvent extraction after decomposing any residual oxidizing agent to produce a stream containing the sulfur-oxidated compounds and a hydrocarbonaceous oil stream having a reduced concentration of sulfur-oxidated compounds. The present invention provides a process for the desulfurization of hydrocarbonaceous oil wherein the hydrocarbonaceous oil is contacted with a hydrodesulfurization catalyst in a hydrodesulfurization reaction zone to reduce the sulfur level to a relatively low level and then contacting the resulting hydrocarbonaceous stream from the hydrodesulfurization zone with an oxidizing agent to convert the residual, low level of sulfur compounds into sulfur-oxidated compounds. The residual oxidizing agent is decomposed and the resulting hydrocarbonaceous oil stream containing the sulfur-oxidated compounds is separated to produce a stream comprising the sulfur-oxidated compounds and a hydrocarbonaceous oil stream having a reduced concentration of sulfur-oxidated compounds. In a preferred embodiment of the present invention, the hydrocarbonaceous effluent stream from the hydrodesulfurization zone is contacted with an aqueous oxidizing solution to convert the residual, low level of sulfur compounds into sulfur-oxidated compounds. The resulting hydrocarbonaceous oil stream containing the sulfur-oxidated compounds is treated to decompose any residual oxidizing agent and is contacted with a selective adsorbent having a greater selectivity for the sulfur-oxidated compounds than for the sulfur-free hydrocarbonaceous oil to produce an adsorbent containing at least a portion of the sulfur- oxidated compounds and a hydrocarbonaceous oil stream having a reduced concentration of sulfur-oxidated compounds. The drawing is a simplified process flow diagram of a preferred embodiment of the present invention. The present invention provides an improved integrated process for the deep desulfurization of hydrocarbonaceous oil in a two-stage desulfurization process. In accordance with the present invention, a preferred hydrocarbonaceous oil feedstock contains distillable hydrocarbons boiling in the range from 93°C (200°F) to 565°C (1050°F) and more preferably from 149°C (300°F) to 538°C (1000°F). The hydrocarbonaceous oil feedstock is contemplated to contain from 0.1 to 5 weight percent sulfur and the process is most advantageously utilized when the feedstock contains high levels of sulfur and the desired desulfurized product contains a very low concentration of sulfur. Preferred product sulfur levels are less than 100 wppm, more preferably less than 50 wppm, and even more preferably less than 30 wppm. The hydrocarbonaceous oil containing sulfur compounds is introduced into a catalytic hydrodesulfurization zone containing hydrodesulfurization catalyst and maintained at hydrodesulfurization conditions. The catalytic hydrodesulfurization zone may contain a fixed, ebullated or fluidized catalyst bed. This reaction zone is preferably maintained under an imposed pressure from 101 kPa (14.7 psig) to 13.9 MPa (2000 psig) and more preferably under a pressure from 800 kPa (100 psig) to 12.5 MPa (1800 psig). Suitably, the hydrodesulfurization reaction is conducted with a maximum catalyst bed temperature in the range from 204°C (400°F) to 400°C (750°F) selected to perform the desired hydrodesulfurization conversion to reduce the concentration of the sulfur compounds to the desired level. In accordance with the present invention, it is contemplated that the desired hydrodesulfurization conversion includes, for example, desulfurization, denitrification and olefin saturation. Further preferred operating conditions include liquid hourly space velocities in the range from 0.05 hr. "1 to 20 hr. "1 and hydrogen to feed ratios from 200 standard cubic feet per barrel (SCFB) (33.7 nmVm3) to 50,000 SCFB (8425 nm3/m3), preferably from 200 SCFB (33.7 nm3/m3) to 10,000 SCFB (1685 nm3/m3). The hydrodesulfurization zone operating conditions are preferably selected to produce a desulfurized hydrocarbonaceous oil containing from 100 to 1000 wppm sulfur. [OO 14] The preferred catalytic composite disposed within the hereinabove-described hydrodesulfurization zone can be characterized as containing a metallic component having hydrodesulfurization activity, which component is combined with a suitable refractory inorganic oxide carrier material of either synthetic or natural origin. The precise composition and method of manufacturing the carrier material is not considered essential to the present invention. Preferred carrier materials are alumina, silica, and mixtures thereof. Suitable metallic components having hydrodesulfurization activity are those selected from the group comprising the metals of Groups VIB and VET of the Periodic Table, as set forth in the Periodic Table of the Elements, E.H. Sargent and Company, 1964. Thus, the catalytic composites may comprise one or more metallic components from the group of molybdenum, tungsten, chromium, iron, cobalt, nickel, platinum, palladium, iridium, osmium, rhodium, ruthenium, and mixtures thereof. The concentration of the catalytically active metallic component, or components, is primarily dependent upon a particular metal as well as the physical and/or chemical characteristics of the particular hydrocarbon feedstock. For example, the metallic components of Group VIB are generally present in an amount within the range of from 1 to 20 weight percent, the iron-group metals in an amount within the range of 0.2 to 10 weight percent, whereas the noble metals of Group VHI are preferably present in an amount within the range of from 0.1 to 5 weight percent, all of which are calculated as if these components existed within the catalytic composite in the elemental state. In addition, any catalyst employed commercially for hydrodesulfurizing middle distillate hydrocarbonaceous compounds to remove nitrogen and sulfur may function effectively in the hydrodesulfurization zone of the present invention. It is further contemplated that hydrodesulfurization catalytic composites may comprise one or more of the following components: cesium, francium, lithium, potassium, rubidium, sodium, copper, gold, silver, cadmium, mercury and zinc. The hydrocarbonaceous effluent from the hydrodesulfurization reaction zone is separated to produce a gaseous stream containing hydrogen, hydrogen sulfide and normally gaseous hydrocarbons, and a liquid hydrocarbonaceous stream having a reduced concentration of sulfur compounds. This resulting liquid hydrocarbonaceous stream in one preferred embodiment of the present invention is contacted with an aqueous oxidizing solution in an oxidation zone to convert sulfur-containing compounds into sulfur-oxidated compounds. Any suitable known aqueous oxidizing solution may be used to perform the sulfur oxidation. In a preferred embodiment, the aqueous oxidizing solution contains acetic acid and hydrogen peroxide. Preferably the molar feed ratio of hydrogen peroxide to sulfur ranges from 1 to 10 or more and the molar ratio of acetic acid to hydrogen peroxide ranges from 0.1 to 10 or more. The oxidation conditions including contact time are selected to give the desired results as described herein and the pressure is preferably great enough to maintain the aqueous solution in a liquid phase during the contacting of the hydrocarbonaceous oil. Preferred oxidation conditions include a pressure from atmospheric to 800 kPa (100 psig), and a temperature from 38°C (100°F) to 149°C (300°F). Since the aqueous oxidizing solution and the hydrocarbonaceous oil are immiscible, the oxidation zone must have the ability to intimately mix and contact the two phases to ensure the completion of the chemical oxidation. Any suitable means may be used for the contacting and preferred methods include the use of a packed mixing column with countercurrent flows of the two phases or in-line mixing apparatus. [OO 16] In the event that there is residual hydrogen peroxide after the completion of the oxidation, it is preferred that the stream containing the residual hydrogen peroxide is contacted with a suitable catalyst to decompose the hydrogen peroxide. A preferred hydrogen peroxide decomposition catalyst is a supported transition metal, a transition metal complex or a transition metal oxide. The decomposition of the hydrogen peroxide is conducted to simplify the recovery and separation of the reaction products including sulfur-oxidated compounds recovered from the oxidation zone. Preferred decomposition operating conditions include a pressure from atmospheric to 800 kPa (100 psig) and a temperature from 38°C (100°F) to 149°C (300°F). The resulting effluent from the oxidation zone after decomposition of the oxidizing agent contains desulfurized hydrocarbonaceous oil, sulfur-oxidated compounds such as sulfoxides and sulfones, for example, water and acetic acid. This resulting effluent from the oxidation zone is contacted with a selective adsorbent having a greater selectivity for the sulfur-oxidated compounds than for the sulfur- free hydrocarbonaceous oil to produce a selective adsorbent containing at least a portion of the sulfur-oxidated compounds and a hydrocarbonaceous oil having a reduced concentration of sulfur. Any suitable known selective adsorbent may be used to selectively extract the sulfur-oxidated compounds. In a preferred embodiment of the present invention, the selective adsorbent is selected from the group consisting of aluminosilicates such as X and Y type zeolites, zeolite beta, and L-zeolite, highly silaceous zeolites such as ZSM-5 and silicalite, and silica aluminophosphates such as SAPO-34. The preferred selective adsorbents are contacted with the effluent from the oxidation zone in an adsorption zone. In a preferred mode, the sulfur-oxidated compounds are adsorbed with thermally stable aluminosilicates such as Y-type zeolite, dealuminated Y type zeolite, zeolite beta, and zeolite L. The raffinate hydrocarbonaceous oil recovered from the adsorption zone preferably contains less than 100 weight ppm, more preferably less than 50 weight ppm sulfur and even more preferably less than 30 wppm. [OO 18] The resulting adsorbent is regenerated to recover the adsorbed sulfur-oxidated compounds and the regenerated adsorbent is preferably recycled to the adsorption zone. The regeneration of the adsorbent may be accomplished by desorbing the adsorbed sulfur-oxidated compounds by heating and/or by contacting with a liquid or vapor desorbent. In one embodiment, operation of the invention is achieved as a fixed bed adsorber by introducing reacted mixture from the sulfur oxidation zone to an adsorption zone until a selected portion of the adsorptive capacity of the selective adsorbent is exhausted. By suitable valving means the flow of reacted mixture from the sulfur oxidation zone is then halted and the exhausted adsorption zone is regenerated in a desorption zone by desorbing the sulfur-oxidated compounds from the adsorbent with desorbent material. In this manner, a single fixed bed may be so employed in the desulfurization process of the instant invention. In another embodiment, operation of the invention is achieved as a fixed bed adsorber by introducing reacted mixture from the sulfur oxidation zone to a first adsorption zone until a selected portion of the adsorptive capacity of the selective adsorbent is exhausted. By suitable valving means the flow of reacted mixture from the sulfur oxidation zone is then redirected to a second adsorption zone containing selective adsorbent which has been previously regenerated and the exhausted adsorption zone is regenerated in a desorption zone by desorbed the sulfur-oxidated compounds from the adsorbent with desorbent material. In this manner, any desired number of fixed beds may be so arranged in the desulfurization of the instant invention. In another embodiment, operation of the invention is achieved as a fluidized or ebullated bed adsorber by introducing reacted mixture from the sulfur oxidation zone to an fluidized adsorption zone until a selected portion of the adsorptive capacity of the selective adsorbent is exhausted. By suitable means at least a portion of the exhausted adsorbent from the adsorption zone is then redirected to a desorption zone and the exhausted adsorbent is regenerated desorbing the sulfur-oxidated compounds from the adsorbent with desorbent material. In yet another embodiment, operation of the invention is achieved as simulated countercurrent adsorber by introducing reacted mixture from the sulfur oxidation zone to a moving bed adsorption zone until a selected portion of the adsorptive capacity of the selective adsorbent is exhausted. By suitable means at least a portion of the exhausted adsorbent from the adsorption zone is then redirected to a desorption zone and the exhausted adsorbent is regenerated desorbing the sulfur-oxidated compounds from the adsorbent with desorbent material. With reference now to the drawing that illustrates a two-bed fixed adsorber operation, with one bed in the adsorption mode and one bed in the desorption mode, a hydrocarbonaceous oil containing sulfur is introduced into the process via line 1 and enters hydrodesulfurization zone 3. A fresh hydrogen stream is introduced via line 2 and is admixed with a hydrogen-rich gaseous recycle stream provided via line 7 and the resulting admixture is introduced into hydrodesulfurization zone 3 via line 2. A gaseous stream containing hydrogen, hydrogen sulfide and normally gaseous hydrocarbons is removed from hydrodesulfurization zone 3 via line 5 and at least a portion is recycled via line 7 as described hereinabove and at least another portion is removed from the process via line 6. A hydrocarbonaceous stream having a reduced concentration of sulfur is removed from hydrodesulfurization zone 3 via line 4 and introduced into sulfur oxidation zone 8 via line 12 along with a carboxylic acid stream provided via lines 9, 11 and 12, and an aqueous hydrogen peroxide stream which is introduced into the process via lines 10, 11 and 12. The aqueous stream and the hydrocarbonaceous stream are intimately admixed in sulfur oxidation zone 8 in order to oxidize the sulfur compounds. A resulting reacted mixture is removed from sulfur oxidation zone 8 via line 13 after decomposing any residual hydrogen peroxide and is transported via line 14, valve 15, lines 16 and 17 and is introduced into adsorption zone 18 and is contacted with previously regenerated selective adsorbent. A resulting hydrocarbonaceous stream containing a reduced concentration of sulfur is removed from adsorption zone 18 via line 19, line 20, valve 21, line 22 and line 23 and recovered. Desorbent stream 25, optionally comprising fresh desorbent stream 24 and/or recycled desorbent carried via line 37 is introduced via line 25, line 26, valve 27, line 28, and line 29 into a previously exhausted adsorption zone comprising desorption zone 30. A desorption stream rich in oxidized sulfur compounds is removed from desorption zone 30 via line 31, line 32, valve 33, line 34, and line 49 and is introduced into distillation zone 35. A desorbent stream having a reduced concentration of sulfur-oxidated compounds is removed from distillation zone 35 via line 37 and is optionally recycled to desorption zone 30 as hereinabove described. Oxidized sulfur compounds are removed from distillation zone 35 via line 36 and recovered. When adsorption zone 18 becomes spent, the stream carried via line 13 is transported via line 38, valve 39, line 40, and line 31 and is introduced into previously regenerated desorption zone 30. The now adsorption zone 30 produces an effluent stream having a reduced concentration of sulfur compounds which stream is transported via line 29, line 41, valve 42, line 43, and line 23 and recovered. The spent adsorption zone 18 is regenerated by the introduction of a desorption stream carried via line 25, line 44, valve 45, line 46, and line 19 into spent adsorption zone 18. A resulting effluent is recovered via line 17, line 16, valve 47, line 48, and line 49 and introduced into distillation zone 35. Selective adsorbents useful in the present invention are identified by the following illustrative calculations. These calculations are, however, not presented to unduly limit the selective adsorbents useful in this invention, but to illustrate the molecular properties of the sulfur-containing and sulfur-oxidated compounds that play a role in the adsorption and removal from hydrocarbonaceous oil in the hereinabove described embodiment. The following results were not obtained by the actual measurement of the properties of the compounds but are considered prospective and reasonably illustrative of the expected performance of the invention based upon sound quantum chemistry calculations. The chemical structures and selected molecular properties of methyl thiophene, methyl thiophene sulfone, methyl thiophene sulfoxide, benzothiophene, benzothiophene sulfone, and benzothiophene sulfoxide were calculated by the use of semi-empirical molecular orbital theory using the PM3 Hamiltonian as described by J.J.P. 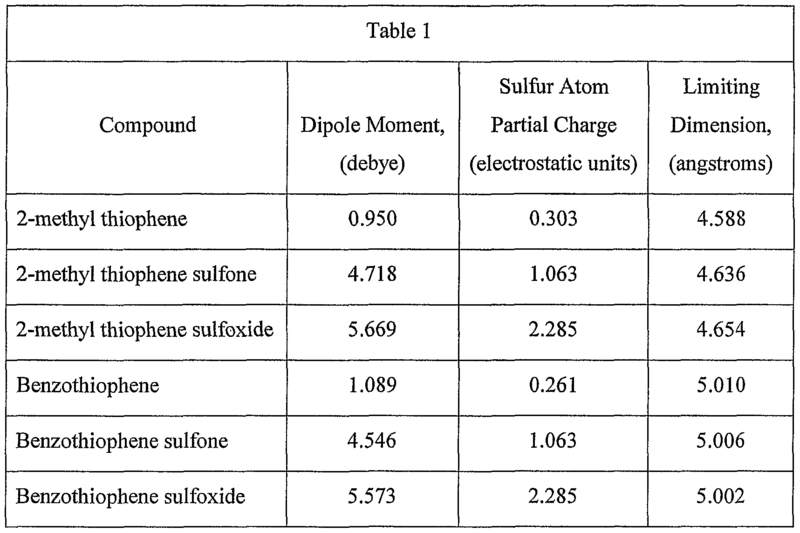 Stewart, "Optimization of Parameters for Semi-Empirical Methods 1 -Method", Journal of Computational Chemistry, Volume 10, 1989, pages 209-220, and are presented in Table 1. A first property affecting selective adsorption of the sulfur-oxidated molecules compared to the molecules comprising is dipole moment. Dipole moment increases upon oxidation of the sulfur-containing molecules and reflects an increase in polarity of the sulfur- oxidated molecules compared to hydrocarbonaceous oil molecules and un-oxidized sulfur- containing molecules. Such an increase in dipole moment increases the adsorption selectivity for the sulfur-oxidated molecules compared to un-oxidized sulfur-containing molecules and molecules comprising hydrocarbonaceous oil, when using such adsorbents as silica, alumina, silicates, aluminosilicates and aluminophosphates in the instant invention. A second property affecting selective adsorption of the sulfur-oxidated molecules compared to the molecules comprising is the atomic partial charge on the sulfur atom. Positive partial charge on sulfur increases upon oxidation of the sulfur-containing molecules and reflects an increase in electrostatic attraction for the sulfur-oxidated molecules to adsorbent atoms bearing negative partial charge compared to hydrocarbonaceous oil molecules and un- oxidized sulfur-containing molecules. Such an increase in electrostatic attraction increases the adsorption selectivity for the sulfur-oxidated molecules compared to un-oxidized sulfur- containing molecules and molecules comprising hydrocarbonaceous oil, when using such adsorbents such as silica, alumina, silicates, aluminosilicates and aluminophosphates in the instant invention. A third property that affects selective adsorption of the sulfur-oxidated molecules in preference of the un-oxidized sulfur-containing molecules is molecular size. The crystalline structure of certain selective adsorbents such as crystalline silicates, aluminosilicates, and aluminophosphates may manifest channels and pores that are of molecular dimensions. In the present invention, if the sulfur-oxidated molecules are small enough to gain access to such channels and pores, they may be selectively adsorbed compared to larger molecules in the hydrocarbonaceous oil. The calculated limiting dimensions for the sulfur-oxidated molecules indicate that such molecules can gain access to the pore structures and be selectively adsorbed by such adsorbents as X and Y-type zeolites, dealuminated Y zeolite, L-zeolite, beta zeolite, SAPO-34, and the like. In addition, because many such microporous adsorbents display a selectivity for more polar molecules compared to less polar molecules, enhancement of dipole moment and sulfur positive partial charge via sulfur oxidation while not increasing the limiting molecular dimension makes these adsorbents particularly advantageous for use in the instant invention. 482°C (900°F) and containing 2 weight percent sulfur is introduced into a hydrodesulfurization zone containing a hydrodesulfurization catalyst which contains alumina, nickel, molybdenum and phosphorus. The hydrodesulfurization zone is operated at a pressure of 11.8 MPa (1700 psig), a hydrogen to feed ratio of 843 nm3/m3 (5000 SCFB) and a maximum catalyst temperature of 393°C (740°F) to reduce the residual sulfur in the resulting desulfurized vacuum gas oil to 500 weight ppm (0.05 weight percent). The desulfurized vacuum gas oil is then introduced into an oxidation reaction zone and contacted with acetic acid and hydrogen peroxide in water. The molar feed ratio of hydrogen peroxide to sulfur is 5 and the molar ratio of acetic acid to hydrogen peroxide is 5, and the contacting is conducted at a temperature of 65°C (150°F) and a pressure of 207 kPa (30 psig). The effluent from the oxidation reaction zone is passed over a catalyst containing a mixed oxide of iron and molybdenum to decompose the unreacted hydrogen peroxide and then introduced into an adsorber wherein the sulfur-oxide compounds are extracted with Y zeolite as a selective adsorbent to produce a finished product containing less than 30 weight ppm sulfur. A spent selective adsorbent is regenerated to remove sulfur-oxide compounds and the subsequently regenerated adsorbent is returned to adsorbent service. The foregoing description, drawing and illustrative embodiment clearly illustrate the advantages encompassed by the process of the present invention and the benefits to be afforded with the use thereof. 1. A process for the desulfurization of a hydrocarbonaceous oil which process comprises: (a) contacting the hydrocarbonaceous oil (1) with a hydrodesulfurization catalyst in a hydrodesulfurization reaction zone (3) at hydrodesulfurization conditions to produce hydrogen sulfide and a resulting first hydrocarbonaceous oil stream having a reduced concentration of sulfur (4); (b) contacting the first hydrocarbonaceous oil stream having a reduced concentration of sulfur with an aqueous oxidizing solution (10) in an oxidation zone (8) to produce a second hydrocarbonaceous oil stream comprising sulfur-oxidated compounds (13); (c) contacting the second hydrocarbonaceous stream comprising sulfur-oxidated compounds from step (b) with a selective adsorbent (18, 30) having a greater selectivity for the sulfur-oxidated compounds than for sulfur-free hydrocarbonaceous oil to produce an adsorbent (18, 30) containing at least a portion of the sulfur-oxidated compounds and a third hydrocarbonaceous oil stream having a reduced concentration of sulfur-oxidated compounds (23); (d) separating the adsorbent (18, 30) containing at least a portion of the sulfur- oxidated compounds produced in step (c) to provide an adsorbent (18, 30) rich in sulfur-oxidated compounds; and (e) recovering the third hydrocarbonaceous oil stream (23). 2. The process of claim 1 wherein the hydrocarbonaceous oil (1) boils in the range from 149°C (300°F) to 538°C (1000°F). 3. The process of claim 1 wherein the hydrodesulfurization reaction zone (3) is operated at conditions which include a pressure from 800 kPa (100 psig) to 12.5 MPa (1800 psig), a maximum catalyst temperature from 204°C (400°F) to 400°C (750°F) and a hydrogen to feed ratio from 33.7 nm3/m3 (200 SCFB) to 1685 nm3/m3 (10,000 SCFB). 4. The process of claim 1 wherein the hydrodesulfurization catalyst (3) comprises a Group VIB metal component, a Group VIII metal component and alumina. 5. The process of claim 1 wherein the hydrocarbonaceous oil stream having a reduced concentration of sulfur (4) and produced in step (a) has a sulfur level from 100 ppm to 1000 ppm. 6. The process of claim 1 wherein the oxidation zone (8) contains an oxidation catalyst. 7. The process of claim 1 wherein at least a portion of any residual oxidizing solution from the step (b) is decomposed. 8. The process of claim 1 wherein the aqueous oxidizing solution (10) comprises hydrogen peroxide and a carboxylic acid. 9. The process of claim 12 wherein the oxidation zone (8) is operated at conditions including a molar feed ratio of hydrogen peroxide to sulfur ranging from 1 to 10 and a molar ratio of carboxylic acid to hydrogen peroxide from 0.1 to 10. 10. The process of claim 1 wherein the oxidation zone (8) is operated at conditions including a pressure from atmospheric to 800 kPa (100 psig) and a temperature from 38°C (100°F) to l49°C (300°F). 11. The process of claim 1 wherein the selective adsorbent (18, 30) is selected from the group consisting of silica, alumina, silicalite, ZSM-5, zeolite L, X and Y-type zeolites, dealuminated Y-type zeolite, zeolite beta, zeolite omega, and SAPO-34. 12. The process of claim 1 wherein the contacting in step (c) is selected from the group of consisting of fixed bed, ebullated bed, fluidized bed, or counter current solid-liquid contacting.